In DEATH AT CHINATOWN amateur sleuth Emily Cabot is drawn into a murder mystery that pulls her into the heart of Chicago’s Chinatown–a place as foreign as a trip to the moon would have been to most Caucasians during the summer of 1896. Invited by her husband, Dr. Stephen Chapman, Emily attends a demonstration of a Roentgen device (an early x-ray machine) where she is introduced to visiting Chinese doctors, Mary Stone and Ida Kahn. Emily is initially unimpressed because she expected the women to be exotic creatures in native dress, but to her surprise they are Americanized, at least outwardly, from head to toe. The women had been studying medicine at the University of Michigan and were stopping off in Chicago before returning to China to open a clinic–that is until one of them is accused of the murder of a Chinese herbalist. As Emily becomes better acquainted with Drs. Stone and Kahn she discovers the enormous personal sacrifices that they had made in order to assimilate during their time in the U.S. and to pursue their studies in medicine. Some of the struggles that Stone and Kahn faced in pursuit of their careers were familiar to Emily. Prior to becoming a mother Emily had been a researcher and lecturer with an interest in crime—in fact she had been involved in police investigations and she enjoyed the challenges. The clock is ticking on a lecturer’s position held open for her during her pregnancies and Emily must make up her mind soon or likely forever forfeit the chance to resume her career. Emily is also in the midst of a domestic crisis. She is worried that she is losing Stephen—he is often away overnight ostensibly conducting medical research—but is he? She wonders if there is more to his absences from home than the demands of his career. Emily faces a thoroughly modern dilemma with which many readers will empathize. Can she be the mother she wants to be and still carve out time to pursue her passion for research? Her investigation into the herbalist’s death is the catalyst for change in Emily’s marriage, her approach to motherhood and her feelings about her career. 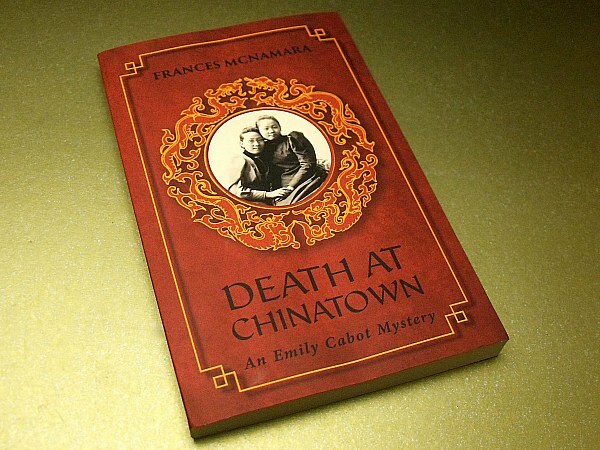 Author Frances McNamara does an excellent job of guiding the reader not only through the Chicago of over one hundred years ago, but through the myriad streets, small shops and unfamiliar culture of Chinatown and its inhabitants. The mystery that that drives the narrative gives Ms. McNamara an opportunity to examine the topics of immigration, women’s rights and the ramifications of scientific discoveries—issues which are as timely now as they were then. Also, I was not all surprised to discover that Ms. McNamara is a librarian, her research is impeccable. She populates the novel with both real and imaginary characters and events which, for me, added interest and complexity. I was sent DEATH AT CHINATOWN to review–and as I had not read any of the previous Emily Cabot novels I wasn’t sure what to expect; however, I was pleasantly surprised. McNamara paints a vivid picture of Chicago at the end of the 19th century, and I felt as if I was walking along with Emily during her visits to Chinatown. I thoroughly enjoyed my trip back in time—in fact I plan to make the trip again by reading the first four novels in the series.